Friends, I have a little gem to share with you today! 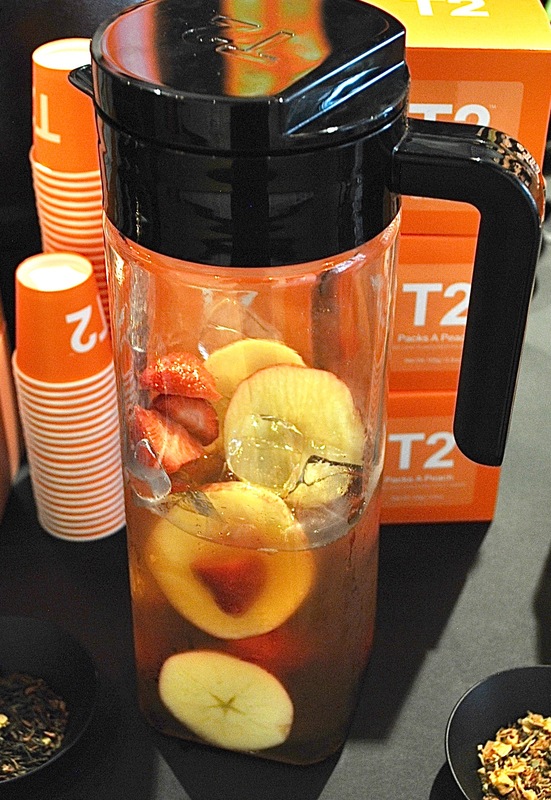 I was recently invited to a T2 Tea Masterclass at the brand new Glasgow T2 store on Buchanan St. As an Australian company, a lot of Glasgow dwellers may be new to the name T2, but I’m not one of them. For once, I appear to be ahead of the curve. See, a few years ago now, I used to live in Melbourne, which is where T2 opened their first ever store. I was a poor backpacker then, and I knew that buying boxes of exotic sounding teas wouldn’t have done my withering bank account any favours- or my backpack. So I didn’t. 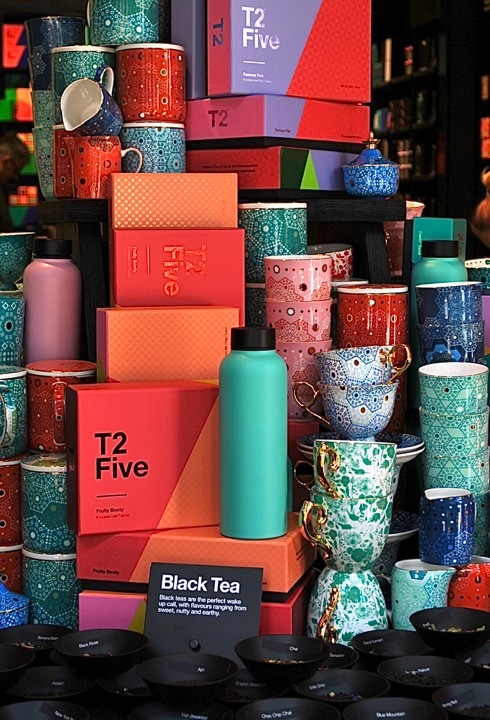 But I remember feeling so enchanted every time I saw a T2 store, with their colourful packaging, shimmering teapots and smiley staff. It all just looked so fun. So when I got invited to the new Glasgow T2 store, I was super excited to accept the offer. Now, I’m going to tell you a secret. The thing is, I am actually not a big tea drinker. English breakfast tea makes me anxious, fruity teas always disappoint me, and green tea? I just can’t get into the bloody stuff. As you may imagine, walking into the masterclass, I wasn’t sure what to expect. As I approached the doors of Glasgow T2, I felt almost fraudulent! As it turned out, the lovely Glasgow T2 store manager Russell wasn’t expecting me. I’d got the wrong day. 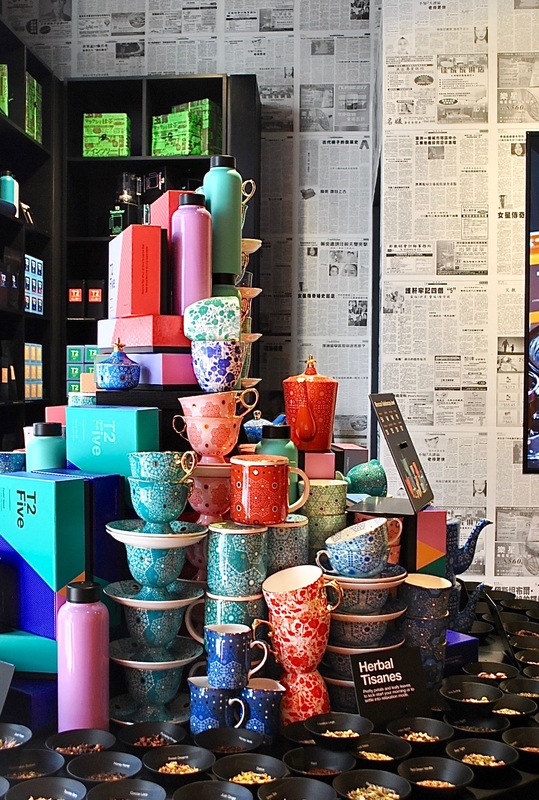 Which made it all the more impressive when he smoothly proceeded to whip out tea after tea from the tall shelves lining the walls with a flourish, dropping facts about their flavours, the brewing process and the best time to drink them as he went along. I decided to be honest with Russell regarding my lack of tea knowledge. I told him I liked black tea, white tea, green tea only in the form of matcha (weird I know), and liquorice tea. ‘Definitely no fruity apple or berry teas’, I added. As we chatted and he decided what to let me try first, I sipped on their signature ‘Sydney Breakfast’ Tea. Bright and bold, it was the perfect mid morning reboot. My first proper cup was the ‘French Earl Grey’, which was surprisingly delicious. Super easy drinking, the notes of rose and hibiscus gave it a slightly floral flavour, without being overwhelmingly perfume-y; a good, albeit surprising start! 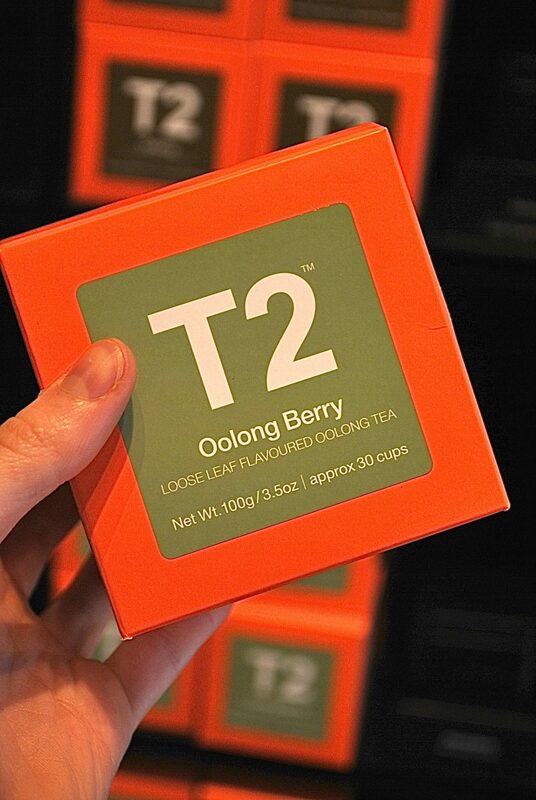 Then it was onto the ‘Oolong Berry’. I’m going to hazard a guess and say that not many people will have a clue what on earth Oolong is. I was one of them, so I asked if I could give it a whirl. Oolong, it turns out, is a traditional Chinese tea that can be described as a halfway house between green tea and black tea. It is made from the leaves of the Camellia sinensis plant, which is the same plant used to make both green tea and black tea. 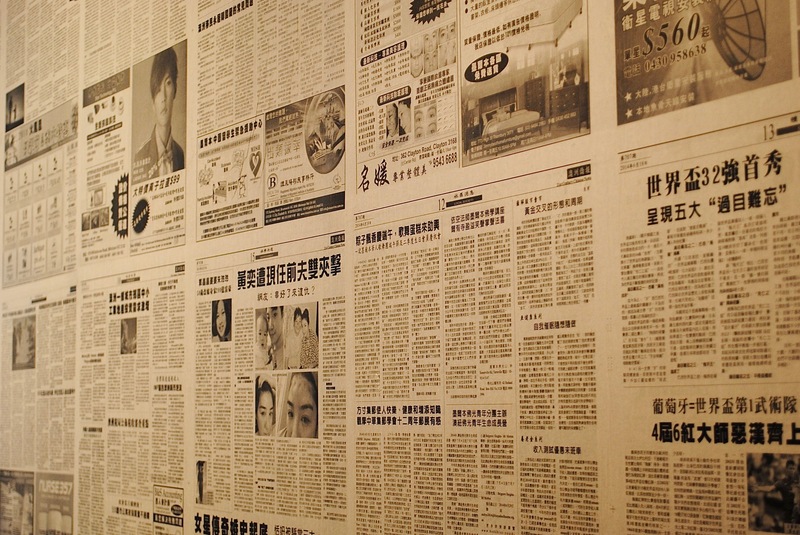 The way that the Oolong tea is processed is what sets it apart. 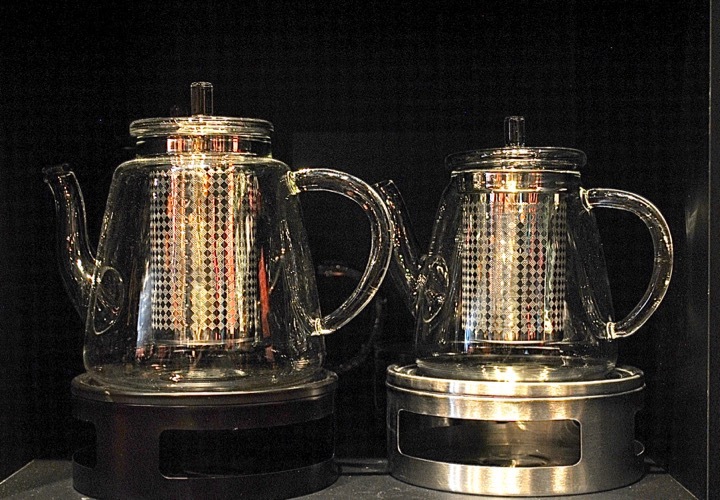 Tea leaves contain special enzymes which undergo a chemical reaction called oxidation. The darker the tea leaves, the more oxidised the tea is. Green tea is minimally oxidised, which is what lends the leaves their green colour. Black tea is fully oxidised, which is what makes the leaves black. Oolong tea? It is only partially oxidised, so it sits somewhere between the two. 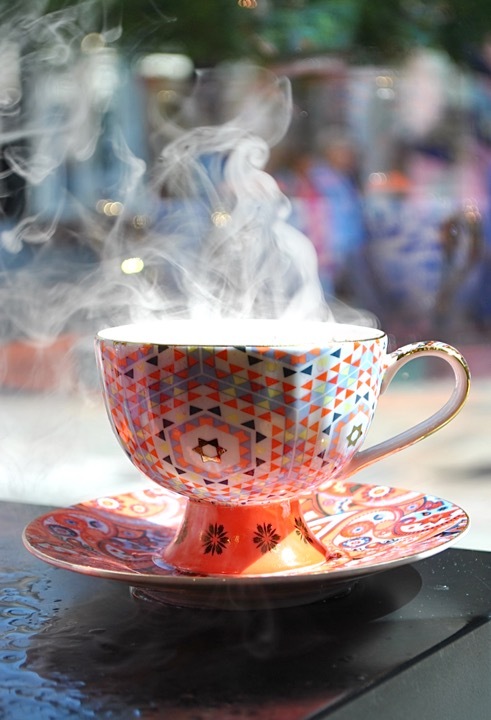 Oolong tea also contains the amino acid theanine, which is responsible for giving you a calm, focused boost of energy. 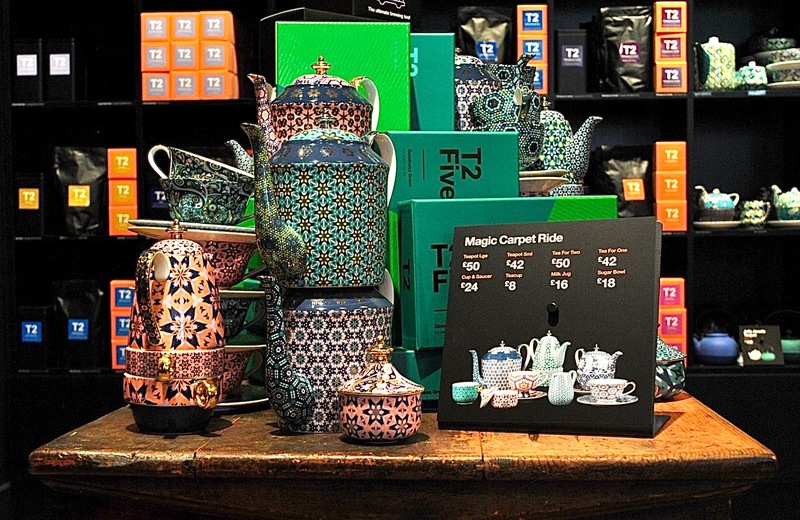 As we moved through the plethora of teas, Russell told me more about the company’s roots. 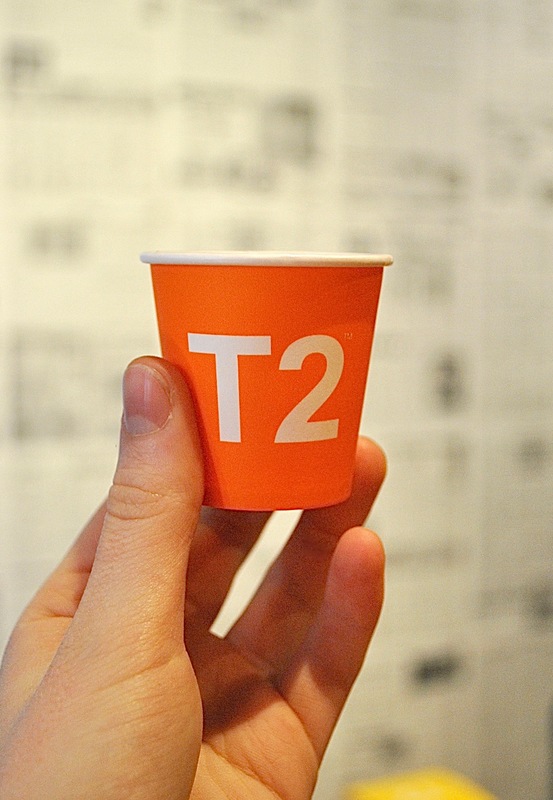 T2 opened its first store in the neighborhood of Fitzroy, Melbourne. 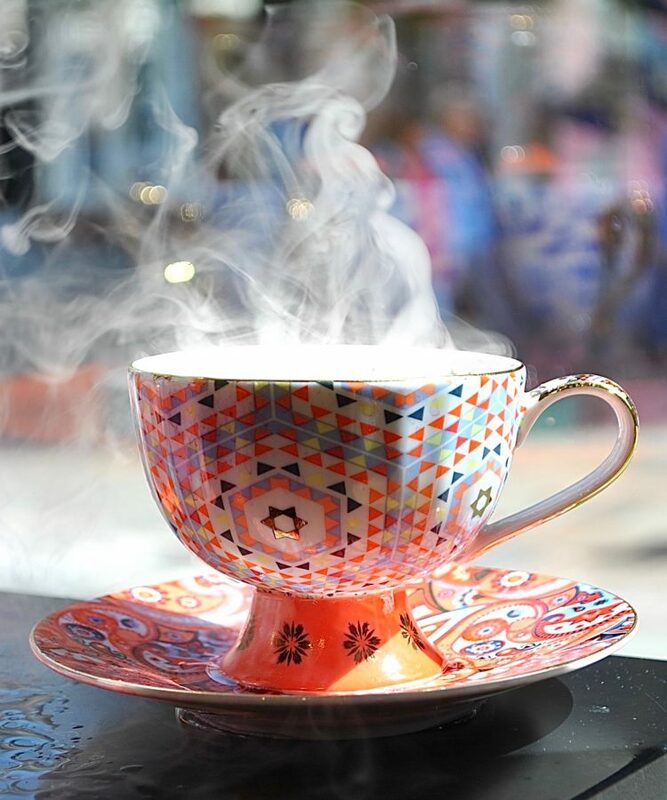 Founder Maryanne Shearer realised one day, over a cup of tea, that Melbourne’s thriving coffee culture had rendered tea a little forgotten about. ‘It doesn’t have to be all about coffee’, she thought. ‘There’s tea, too!’. And so became T2. 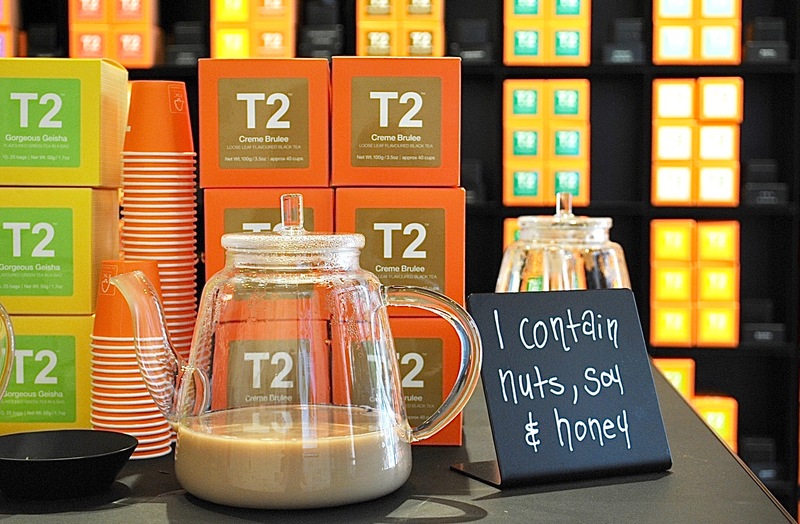 T2 are all about modernising the concept of tea. For them, a cup of tea shouldn’t signal an old fashioned tradition reserved for ladies and gentlemen or the drink you know you’ll be offered when you visit your Gran. It should be anything you want it to be; fun, feminine, masculine, creative, fashionable, inspiring, versatile… you name it! Next up were the herbal tisanes (pronounced ti-zahns). A what?! I hear you ask. Tisanes aren’t actually teas, since they are not derived from the aforementioned Camellia Sinensis plant. They are infusions made from all manner of fragrant or health promoting bits and bobs; berries, seeds, spices, roots, leaves… the list goes on. 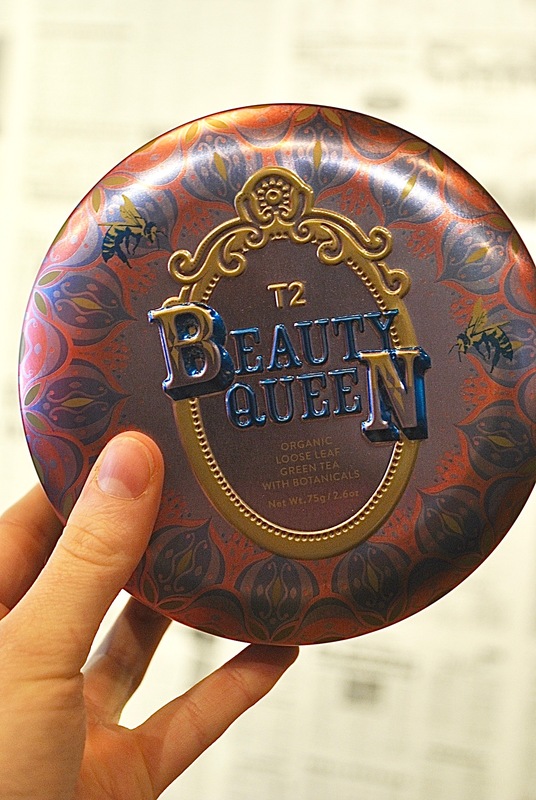 Mint and chamomile are common tisanes, however T2’s tisanes are on a new level of snazzy jazziness. 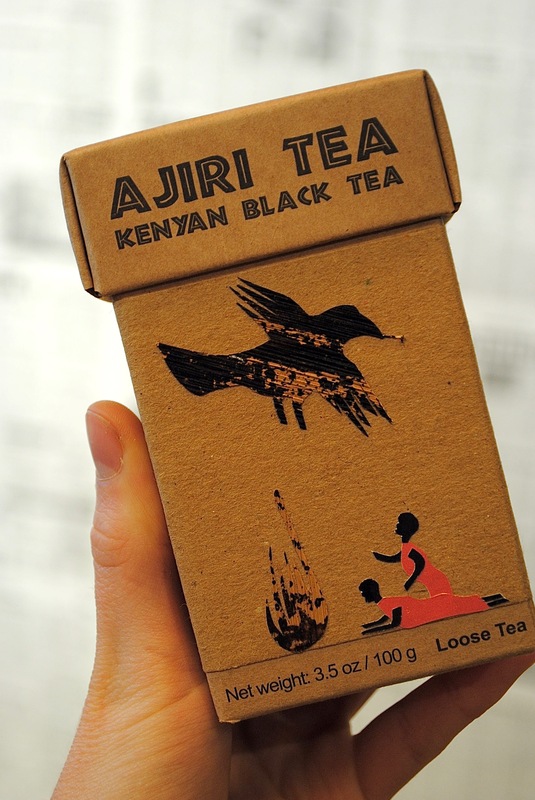 The first one we tried was packed full of peach, papaya, apple and roasted chicory- aptly named ‘Packs a Peach’. Remember how I told Russell to steer clear of all the fruity flavours? He said he wanted to reverse my aversion to them. And that is how I ended up sipping on ‘Packs a Peach’, eyes widening as the sweet yet refreshing flavours washed over me. It was absolutely delicious; something I would readily drink as a chilled summer brew. 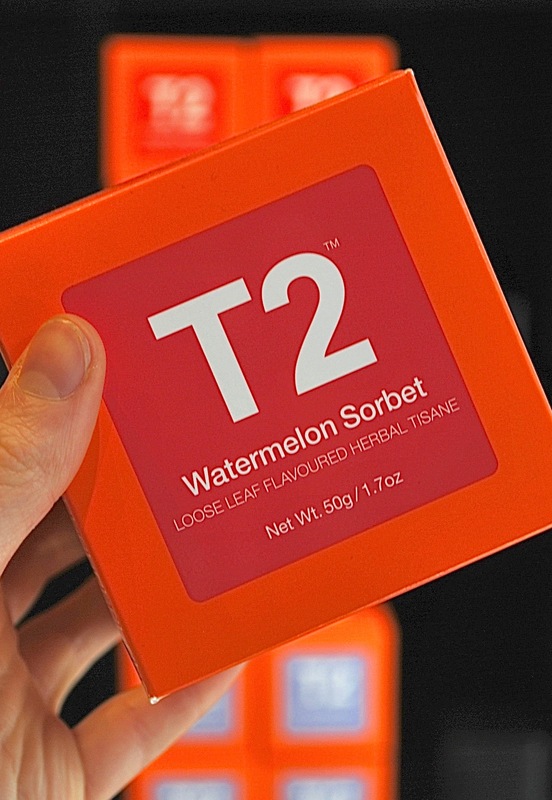 This gave way to a cheeky taste of T2’s ‘Watermelon Sorbet’ tisane. Now, this was a flavour I was CERTAIN that I would hate. Hate is a strong word, but that’s how sure I am of my disgust of watermelon. One of the most unpopular food opinions out there, I know. Andrew will tell you this- we have had many a disagreement over the merits (him) and downfalls (me) of the fruit. …So it was another big surprise when I found myself begrudgingly admitting that T2’s ‘Watermelon Sorbet’ was also bloody delicious. A bit annoying, really. Still not ready to embrace watermelon, I put it down to the hibiscus and spearmint also in the tisane. At the time, I thought that these tisanes could be a great alternative to a sugar laden soda or squash full of artificial flavours, for those with a sweet tooth looking for a yummy summer drink. Unfortunately, I later noticed that the ingredients list included some added sugar. As a result, I wouldn’t recommend drinking this every day, but as a little treat every now and again when the sweet tooth hits. We weren’t finished yet- it was matcha time. As I mentioned above, the only type of green tea that I like is matcha. A lot of people find this weird, since matcha is considered a bit harder going on the earthy taste front. For me, what sets it apart from green tea leaves is that the leaves always taste too bitter to me; just not enjoyable at all. As Russell explained, this is probably because I’ve been making it wrong. 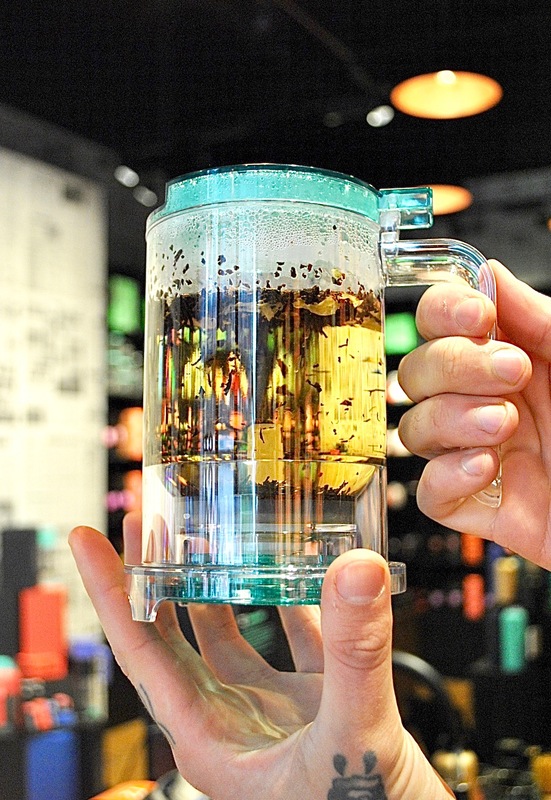 Unlike most black teas, which need to be brewed at 100 degrees, green tea requires water at 80 degrees. Whenever I’ve made green tea in the past, I’ve simply waited for the kettle to boil (100 degrees) and poured it into my cup of green tea. So that’s where I was going wrong. Duh. First up was the T2 ‘Organic Vanilla Matcha’. I have to be honest here and say I was surprised to find that I wasn’t a huge fan. But it was so much fun to see Russell preparing the matcha in the traditional way; using a ceremonial bowl, popping in a teaspoon of the powder, adding the water and whisking until the powder had dissolved and began to froth slightly. The next matcha I tried was the ‘Turmeric Matcha’, and that I would definitely recommend. It was very fresh and easy drinking because neither the turmeric or the matcha were overpowering, and the hint of cinnamon and nutmeg gave the tea a lovely sweet spiciness. Delicious. According to Russell, matcha is not a tea of the type that we drink casually every day, willy nilly. It is a ceremonial tea, which means that Japanese families traditionally prepare it when welcoming people into their home. Today, though, it can be found in most fancy coffee shops, usually in the form of a matcha latte. If you haven’t tried one yet, I’d really encourage it! They’re a fab alternative to coffee if you’re looking for a little boost. T2’s matcha is also ceremonial grade, which means that it is the highest quality, most premium matcha available. 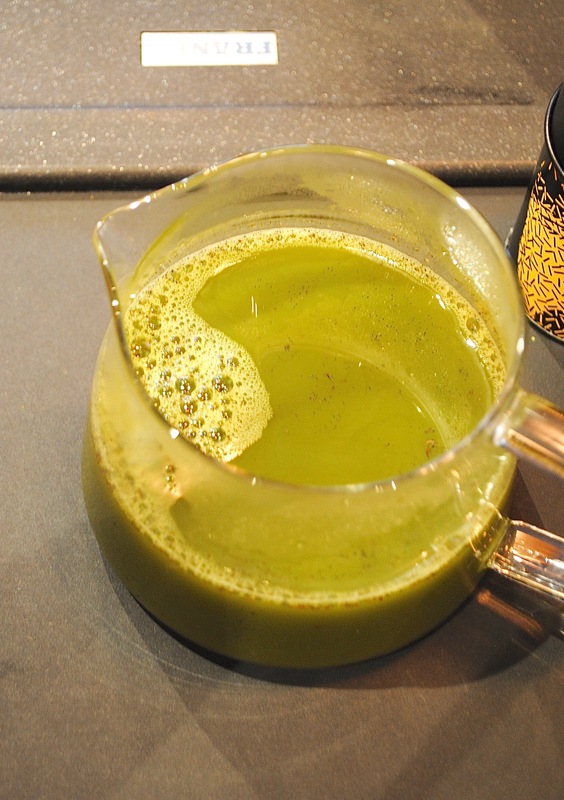 Ceremonial grade matcha tea is made from the youngest tea leaves, with the stems and veins entirely removed. The taste is very delicate. Unlike culinary grade matcha, which can be used for -you guessed it- cooking, ceremonial grade matcha is intended to be whisked with hot water and drank. It should not be mixed with sweeteners or other ingredients, as they mask its true flavour. But if you find yourself struggling with matcha’s earthy taste and need to add half a teaspoon of honey, it’s ok… your secret is safe with me. Pssst… Looking to incorporate matcha into your baking? Look no further than my Vanilla & Matcha Green Tea Bread! 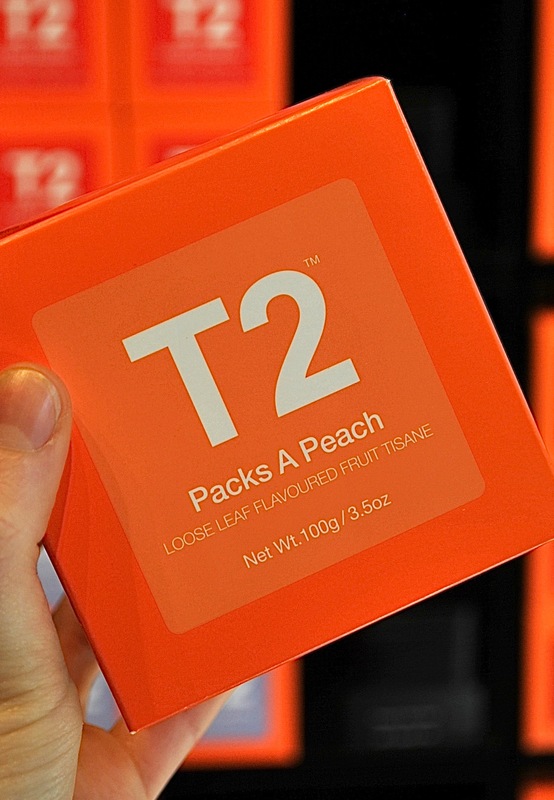 Disclaimer: I was invited to the Glasgow T2 store for review purposes and was fortunate to be given a complimentary product, the Watermelon Sorbet tisane, to take away. Big thanks to the team at Glasgow T2 for the masterclass! 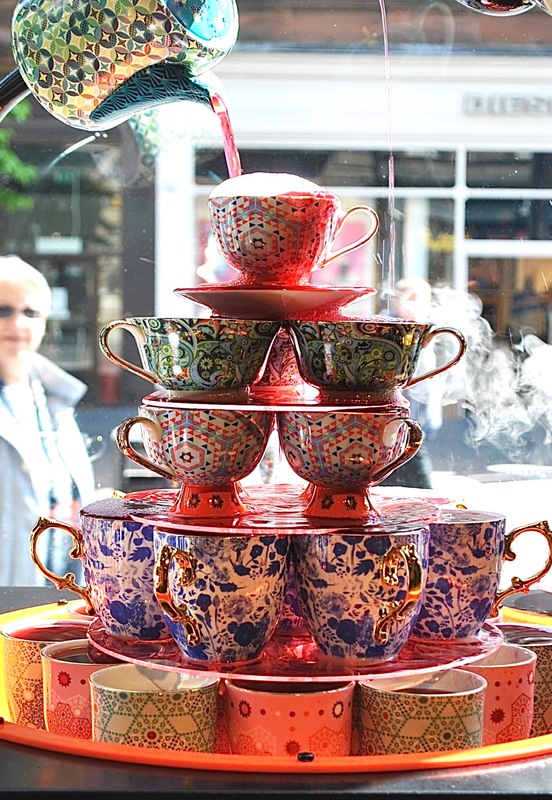 What’s your favourite tea or tisane? 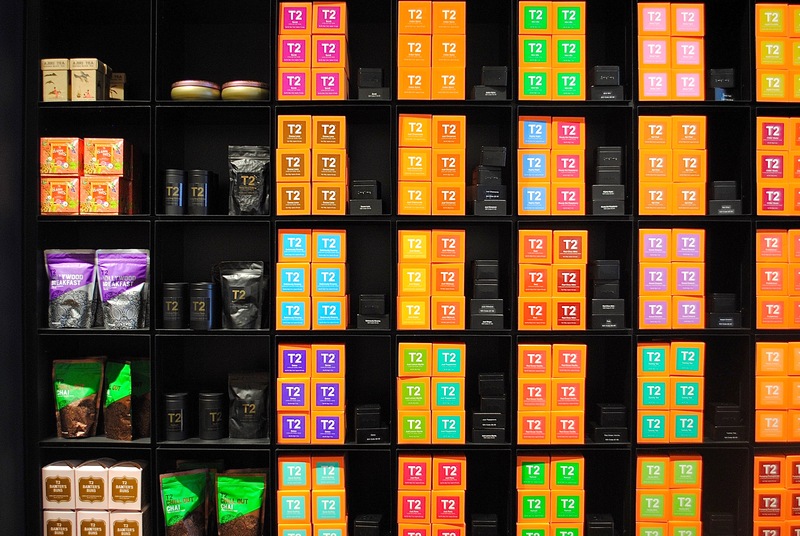 Will you be checking out the new Glasgow T2 store? Leave a comment!